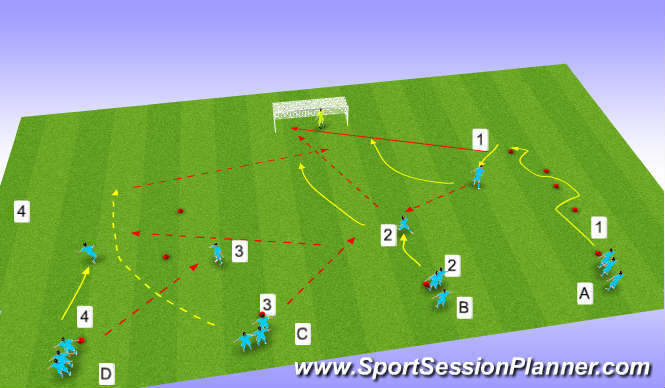 (a)From line A,player 1 dribbles through cones and then takes shot at goal across keeper.He then continues involvement. (b)Immediately from line B,player 2 plays 1-2 with player 1 and takes shot at goal. (c) Immediately from line C player 3 plays pass to player 2 and sprints round as shown to receive pass back from 2 through gate of cones.3 then whips in cross across box for 2 and 1 to run on to and try to score. (d)Immediately player 4 plays ball to either 2,3 or 1.He then partners whoever he gives ball to joins in a 2v2 to try and score. (a)When clearing cone,1 takes goalkeeper on 1v1. (b)2 must sidefoot shot,or take on 1v1,or chip shot. (c)When 3 crosses ball ,must be headed finish. Change cones to left side and work opposite way,encouraging use of other foot. Positive attitude to shoot,technique of striking/quality of shot.Running with ball,ball out of feet,head up,quality of cross,angles and runs of strikers.Angles to receive/movement to support in 2v2.